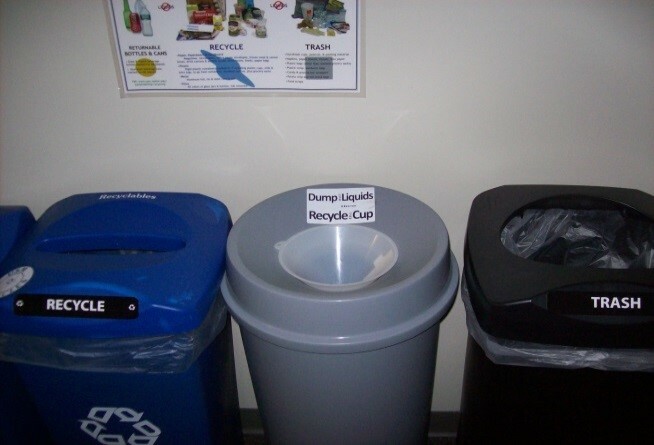 At USM, as with many public waste collection sites, many students throw recyclable cups and bottles into the trash if they still contain remnants of a beverage instead of recycling them. This can increase the need to double bag the trash to prevent spills when custodial staffers are emptying the bins. Even with the trash double bagged there are still many hours spent each year on carpet cleaning to remove coffee and soda spills. Our contract with ecomaine mandates that we pay by the ton to dispose of trash but we can tip recyclable materials for free. Therefore it is more economical to increase our recycling tonnage and decrease our trash tonnage. Liquids weigh approximately eight pounds per gallon, making them expensive to dispose of in the trash. Additionally, our trash goes to an incinerator and liquids do not burn. 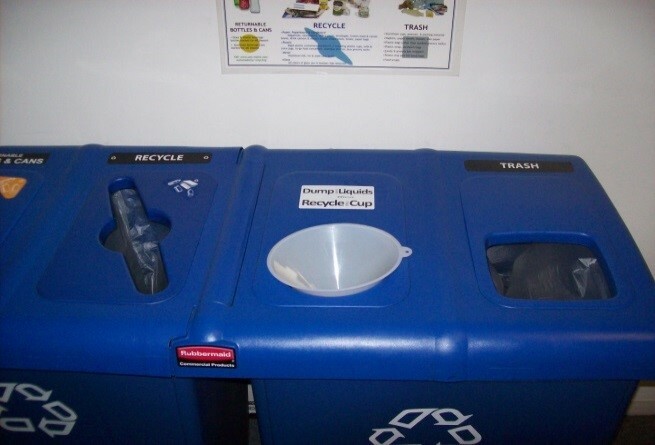 During the summer of 2013 we began converting our waste stations to include liquid recovery. In waste stations that already had four openings (which had been used for returnable bottles, single stream recycling, and two openings for trash) a liquids collection system was easy to add. Funnels cost $2.25 and we used discarded fryer oil jugs from Dining Services to hold the liquids. The team inventoried the new liquid stations on the Portland campus and found that over a month there was a total of 23 to 35 gallons collected per day. At an average of 29 gallons USM is collecting 232 lbs of liquids a day which translates to 20 tons of waste per year. All of these liquids can be poured down the drain in custodial closets at no cost and will not harm the sewer system. Conservatively, liquid diversion could save USM $2,000 per year, with the opportunity to improve upon that with greater participation by users. We currently have liquid containers in most of the academic buildings on the Portland and Gorham campuses. We are working to roll them out in Lewiston and in the Gorham Residence Halls.